When Dodge Cityź? 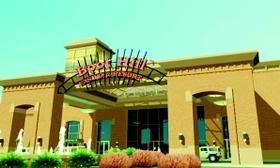 ?s casino opens, its patrons will be allowed to smoke ź?? but only in certain areas. The Dodge City Commission amended its smoking ban Monday night to allow smoking on the casino’s gaming floor and an adjacent lounge area. The zone will be equipped with “Smoking permitted” signs and an air ventilation system designed to eliminate the possibility of smoke drifting outside the zone.